Everything You Need to Know Before Hiking – Hike Lion’s Head. Introduction to Lion’s Head mountain, Cape Town. Lion’s Head hiking trail is a well known among South Africans to be one of the most popular hiking destinations in Cape Town. The Lion’s Head hiking trail is a series of direct and spiral routes, that all end at the Lion’s Head. Best described as a short duration nature hike, Lion’s Head prides itself with wide, unobstructed panoramic views and the best sunset hike in Cape Town. Overview of Lion’s Head mountain and South African National Parks. Lion’s Head is one of two prominent summits to hike up near Cape Town. The other is to summit Table Mountain by one of many different routes. 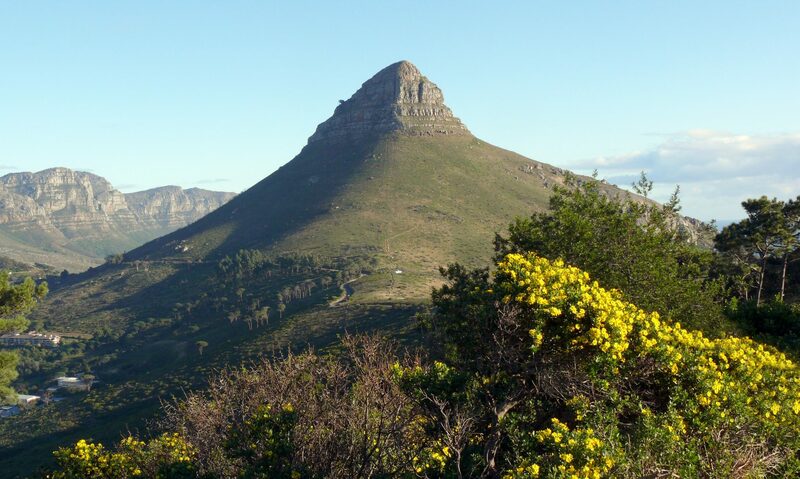 To compare the height of a Lion’s Head hike vs Table Mountain hike, the higher mountain is not Lion’s Head. Lion’s Head peak is elevated at roughly 669 meters when compared to Table Mountain at a whopping 1085 meters. That’s high! The hike route is easy to medium intensity and the technical level of the Lion’s Head hike is 2 out of 5. That makes for some easy and great hiking just within minutes from the city. Hout Bay and Robben Island. Fynbos, the type of plant life found on Lion’s Head, is only found in the southern tip of Africa. Fynbos has some unique properties such as being well suited to dry and hot climates like Cape Town. The history of Lion’s head mountain and why it is called Lion’s Head. The name Lion’s Head comes from the shape of the mountain. Lion’s Head from a distance resembles the shape of a crouching lion! It takes some imagination to get the picture but you may eventually see the mane, body and tail resembling the lion. What to expect from the start of the Lion’s Head hike? The Lion’s Head hike takes you on a journey of one of the best hiking trails in Cape Town. The hike starts at a designated time with collection from your accommodation. Then, we drive to Lion’s Head to start the hiking trail. There are two choices for hiking trails up Lion’s Head. The first hiking trail up Lion’s Head is the Lion’s Head Chains. This route is a steep section of vertical rock for about 12 meters supported by chains. It is a route that is possible for beginners and advanced hikers. The second, easier route up Lion’s Head is the Spiral Route. This route has excellent view of the beaches and city alike. Both routes are possible, just let your hiking guide for Lion’s Head know that you are keen to do two different routes in one hike. At the Lion’s Head summit, your group or private hike will take photos and have enough time to enjoy some of the snacks and drinks provided by Hike Lion’s Head company. When finished taking photos and breathing in the marvelous view from on top of Lion’s Head, you will begin a decent down Lion’s Head mountain. On return from your journey, transport may be arranged back to your accommodation at no additional cost. You would have seen the summit of Lion’s Head and shared some amazing nature scenery along the hike. Lion’s Head hike duration and average time to complete a round trip. Lion’s Head is a short duration hike that starts on the road to Signal Hill. The hike takes only a couple of hours to complete and the scenery from on top of the mountain is nothing short of spectacular. To find the appropriate time it takes to hike Lion’s head, you will need to consider your fitness level as well as how many people are attending the hike, if in a group. The time it takes to hike Lion’s Head depends on the fitness level of the individual. Usually it takes between 2-3 hours to complete a full hike up Lion’s Head and back down again depending on how fast the group moves. This time it takes to hike up Lion’s Head is including breaks for photos and refreshments. If you are an average fitness level and are able to complete moderate intensity exercise then Lion’s Head hike will be possible in the aforementioned time. The distance of a Lion’s Head hike and shortest routes. The hiking duration of Lion’s Head is calculated by a distance of 5.5 km round trip. That takes you 1.5 hours to hike up Lion’s Head and approximately 1 hour return. The duration is also dependent on the group size and the weather on the day of the hike. Keep in mind that this duration is an estimate only and if the group takes longer than expected then the time it takes to hike Lion’s Head will increase in time. The fastest route to hike Lion’s Head is the Chains route. The chains route up Lion’s Head takes approximately 45 minutes to 1 hour to complete up the mountain. The alternative route, the Lion’s Head Spiral route takes 1 hour to summit. The best time to hike Lion’s Head with the quickest route is not always the most scenic. This means that a combination of the two routes planned by your Lion’s Head hiking guide will give you the best time and scenery for your Lion’s Head hike. Statistics and need to know fun facts about Lion’s Head mountain. Lion’s Head hike takes around 90 minutes each way. Why you should hike Lion’s head at the right time. The time of day you choose to hike Lion’s Head will effect your mountain preparation and safety guidelines. It is recommended to book a guided hike for Lion’s Head sunset. Sunset on Lion’s Head is not only the best time to hike Lion’s Head but also requires the most careful planning in terms of safety. If you rise and shine early in the morning then Lion’s Head for sunrise may be your thing! We even cater to those whom would otherwise seem a bit out of the ordinary to their family and friends. The 5:30 hike to catch the best Cape Town sunrise is not uncommon. Whatever your preference of hiking time, we are there to guide your journey up Lion’s Head safely and with the most careful attention to the details of your hike. Once a month Hike Lion’s Head team offers an amazing once in a full moon hike. The night time hike up Lion’s Head is as super cool as a hike gets! Hike with us at the start of the evening and see the beauty of Cape Town in a whole different light. There’s more than one route up Lion’s Head. We strongly recommend hiking up Lion’s Head with a guide. Your Lion’s Head mountain guide may also take you on two different hiking routes all in one amazing hike! The chains route and the spiral route of Lion’s Head. Get up close and experience real adventure on Lion’s Head with your best choice of hiking company – Hike Lion’s Head. pitfalls that await individuals planning on hiking Lion’s Head alone. Reserve a Lion’s Head hiking tour and stick to the Lion’s Head Mountain safety guidelines! Routes to summit Lion’s Head mountain and alternative hiking trails. downs. Chains, ladders and grips are available on the former Lion’s Head Chains trail for good hiking safety. The Lion’s Head Spiral route is a more open. scenic ascent of Lion’s Head. The Spiral trail of Lion’s Head is also best for those with a fear of heights. hiking trails in Cape Town. Hike Lion’s Head price and how you will get more than what you pay. The price to hike up Lion’s Head is R 1150.00. The guided hiking tour up Lion’s Head includes all necessary plans and preparations to hike up Lion’s Head, except your choice of clothing to wear on the day of the hike. A personal photographer / guide is even provided to take photos of your 2-3 hour journey up Lion’s Head mountain. Coffee, Tea or Hot Chocolate. WHAT IS NOT INCLUDED IN THE PRICE OF A LION’S HEAD HIKE? Hiking clothing (Jacket, Shoes). Your hiking guide will advise you on the correct clothing to wear on the day of your hike. A recommended hiking gear includes a muli layer cotton clothing with a pull over wind breaker to keep out the wind. Closed shoes for running or hiking are recommended for your hike up Lion’s Head. ARE THERE ANY ADDITIONAL COSTS FOR THE LION’S HEAD HIKE? There are no additional costs to hike up Lion’s Head. R 1150.00 includes everything to hike up the Lion’s Head mountain. DOES THE COST INCLUDE TRANSPORT TO LION’S HEAD MOUNTAIN? Yes. A luxury SUV is used to transport all of our hiking clients to and from their accommodation in Cape Town. What is the best choice of clothing to wear on the day of a Lion’s Head hike? Wear clothing in layers to take off when you get hotter during the hike up Lion’s Head. Closed shoes that cover both the toes and ankles are recommended, running shoes also work. Lion’s Head night time hike at Full Moon. LION’S HEAD, CAPE TOWN IS MARVELOUS AT NIGHT DURING THE FULL MOON. The full moon Hike up Lion’s Head at night is a once in a full moon experience! The full moon hike up Lion’s Head starts around 6-8pm on a full moon night. The occasional hike during the one time of the month is a must try experience! At 669 meters high, Lions Head full moon hike offers some excellent views of the city during the brightly lit hours of a full moon hike. Lion’s Head is surrounded by Table mountain and the city of Cape Town. The city of Cape Town at night lights up in a display of awe. Getting to the top of the Lion’s Head mountain before dark ensures that you will see a clear and beautiful sunset over Cape Town. The hike down Lion’s Head during full moon is rather busy and you will want to go with a group of people to get the most fun and safety out of your Lion’s Head full moon hike. The full moon hike up Lion’s Head takes 45 minute to 1 hour, except you will want to check these times with your hiking guide up Lion’s Head. Start by booking one of our most popular night time hikes. The the same hiking equipment applies to night time hikes as during the day. Bring an extra warm jacket and a torch to light up the Lion’s Head path. The full moon hike is rather lit up because of the distinctly bright time of the month the moon shines but better to be prepared. Bring good hiking shoes, a camera and enough water to sustain a hike up Lions Head. The initially the Lion’s Head full moon hike starts as a steep walk on the lions head contour. This steep trail up Lion’s Head leads to a more leveled path and then out onto an open space populated by wild South African fynbos (indigenous plant species). The Lion’s Head full moon hike has a great view of Sea Point, Green Point and Camps Bay. Get a good walking photograph on Lions Head directly above Signal Hill. With the most scenic backdrop to a picture perfect photograph, you will have time to get some breathtaking night time photographs of the city and surrounding mountains. Our path then develops into the final stretch towards the summit. Suddenly, find yourself looking over an edge. Around a narrow ledge and beneath a sky full of stars. Using the rocks as footholds for yourself pull up onto the first ledge and keeps to the inside track of the mountain by holding onto the Lions Head chains. This is now the last section before we reach the top. Watch out for other people on the path, Lion’s Head can get dangerously packed like the Victoria and Alfred Waterfront on certain nights. Everyone out wants to see that perfect sunset and get the most beautiful star gazing on top of the mountain. It would be best to stick together as a group and listen to your group leader for instructions on where to proceed to next. Next stop, Lion’s Head the panoramic views of Cape Town, it’s vast oceans and surrounding mountains. Lions Head at night looks magnificent, wearing a black dress with sparking diamond jewelry. One more time, looking over your shoulder at the shimmering city lights. We will embark on a journey back down the mountain, just in time for a late night snack or beer at one of Cape Town best craft beer breweries. Many people bring head lamps and we suggest you do the same. Even a cellphone provides better lighting than available from the natural moon light. Full moon hike and night hikes up Lions head gets our Full Moon hikes get fully booked quickly. Members group bookings are limited. Do not miss out and book in advance a few weeks or days before the hike. Full moon or night hiking up Lion’s Head is a must do! Lions Head hike boasts the most spectacular panoramic views and there is no comparing the view to anything else. Hike Lions Head (Cape Town) has pre-planned routes for anyone. Once you have booked your Lion’s Head Hike get ready for at the top sunset destination in Cape Town and await the rise of the Full Moon. Directions to Lion’s Head mountain, Cape Town. From Cape Town center; drive up towards Table Mountain via Kloofneck Road in the direction of Camps Bay. At the intersection between Table Mountain and Signal Hill Road, Turn right onto Signal Hill Road. Follow the road for 100m. Lion;’s Head parking will be on your left. 10 Safety tips to hike Lion’s Head safely. Never hike up Lion’s Head alone. Hiking Lion’s Head along can not only be dangerous by putting your life at risk but is also less fun than hiking with a guide or group. If you are a fast mover or want some piece and quite, we understand that there are all types of people who hike with us. That is why you should choose to hike with a guide that understands your hiking preferences. Hiking in duo or even in a small group can provide great memories. Not to mention that the view is just better when you share it with somebody new. Do not hike up Lion’s Head after dusk. Don’t get us wrong, dusk is a great time to hike Lion’s Head! We just feel that it would be better suited to those familiar with the Lion’s Head trail. If you would like to do a sunset hike, why not book a guide. A guide will advise you on the weather conditions and forecast the best hour to start and end your hike. Things get dark really quickly when the sun goes down and wind may pick up depending on the time and season. There is no need to go wondering whether a sunset hike is possible on the day you would like to hike Lion’s Head. Simply reach out to us to book a once in a lifetime experience and get way more than you bargained. We even provide lighting for late night hikers and those wanting to see the most perfect Lion’s head sunset. Stick to the Lion’s Head hiking path all the way. There have been reported injuries, both minor and serious from straying off the Lion’s Head path. Sticking to the Lion’s Head path will not only ensure your better safety but also make for the best photographs. The Lion’s Head path is there for a reason and there would be no need whatsoever to venture off into the surrounding bush. There are a number of steep rock ledges near the bordering bushes that lend itself to a drop over 10, 20, 30 meters or more. Be wise and use the Lion’s head way. Wear proper closed shoes for Lion’s Head hike. Keep a friend close whilst hiking Lion’s Head mountain. Lion’s Head hike may be daunting at times. There are sections of the hike that require a friend to spot you while you climb the rocks or ladders. Keeping close to someone you know will offer increased safety whilst hiking Lion’s Head. Get a pal to hike Lion’s Head alone or even in the group who knows the route and dangers. Give us a ring, we are always eager to hike. There are no nearby toilet or tap facilities on Lion’s Head. The title says it all. If you need to go pee pee, then the only place on the mountain is the bush. Since there is no toilet, the only other alternative is to go before or after the hike. The nearby toilet may be your accommodation so choose to go fill up with water or use the toilet facility at your nearest convenience. Drinks and snacks are provided on hikes, so when you book a hike with us, then all beverages and waters are included in the Lion’s Head hike. Store an emergency number on your phone before hiking. You can easily be ready for the worst case scenario by storing an emergency number in your phone. The number of emergency services stored in your phone before hiking may make the difference between a serious life threatening disaster and a solvable problem. It would be best to note that there are different numbers for different emergency services. Our guides would know who to call in the event of a mishap. Be on the safe side and hire a guide. Let us plan what to do in the event of an emergency while you just enjoy your hike. It’s stress free, go ahead and book a guided hike up Lion’s Head. Do you know that the average temperature on Lion’s Head drops significantly at night? This means that what you wear to your hike late afternoon will effect how warm you will be later on after the sun goes down. Sunset is a magical time to hike Lion’s Head but not without proper planning. We recommend wearing light breathable layers under a wind breaker or jersey on top. This dress code will keep you warmer than if you just wore a t shirt and shorts all the way to the top. Try it! Next time you plan on hiking Lion’s Head, pick out the dress code that you think you would need for hiking after the sunset. We are on call. If you find yourself in need of a clothing check, give us a ring +27 81 762 5551. We would be happy to assist with your Lion’s Head guided hike and more! If it’s raining, rocks on the Lion’s Head trail get slippery. Cape Town and the Lion’s Head trail is usually clear skies most times of year. There are some days though that this is not the case and you may find that it is raining. If it is raining, then the rocks on Lion’s Head may get slippery. During and after rain, it would be best to hike if you have proper clothing and foot ware. Guided hikes are the safest way to hike Lion’s Head at all times. When you want a hike to enjoy, Lion’s Head guided hikes may be the best choice. Guided hikes are not only the most fun but are the safest way to hike Lions Head at all times. Included in a guided hike of Lion’s Head is everything you need to safely hike. There is even transport for guided hikes provided that guests stay near Cape Town city center. The easiest way to hike up Lion’s Head is to book a guided hike. Get the most out of your hike and ask us to reserve your hiking day now! Safety on Lion’s Head is a popular question we get asked. You asked. We answered. Lion’s Head is a mixed route in terms of safety. There are some routes more safe than others. We recommend asking your guide on booking to confirm the route that they will be taking on the day of the hike. If you have a fear of heights then there would be only one route to take with your guide. The other routes are optional and are for the thrill seeking adventurer only. Safety is not only the hiking route but also the weather, temperature and times. All of these three things contribute to your hiking safety. Booking a hike will not only take into account all of these three factors but also offer you valuable insight in your best interests. What you can do to avoid dangers while hiking Lion’s Head. Booking a hike up Lion’s Head will prevent the most common dangers associated with hiking. We strongly recommended the expertise of a guided hike for a number of reasons. a) The guides are knowledgeable b) The routes we take on a regular basis are familiar to us c) We understand your needs and safety d) Hiking Lion’s Head requires a competent person e) To hike Lion’s Head with a guide will give you the best experience. Just go ahead and book a hike! How you can plan for proper mountain safety before hiking Lion’s Head. Don’t hike Lion’s Head alone, Call a friend or ask our guide. Tell somebody your Lion’s Head route that you will hike. Know what to do in an emergency. If you don’t then best call our guide. Be responsible and don’t try anything your mother wouldn’t like to see. Bring your phone fully charged and make sure you get those pictures!